The votes for 2018’s best law firms are in and D’Amore Personal Injury Law is at the top! For the second year in a row D’Amore Law has been named one of the top Medical Malpractice Firms in Maryland, and this year, has also ranked as one of the top Personal Injury Firms in the Daily Record Reader Rankings! The Daily Record is a notable publication sharing prominent information about business and law since 1888. 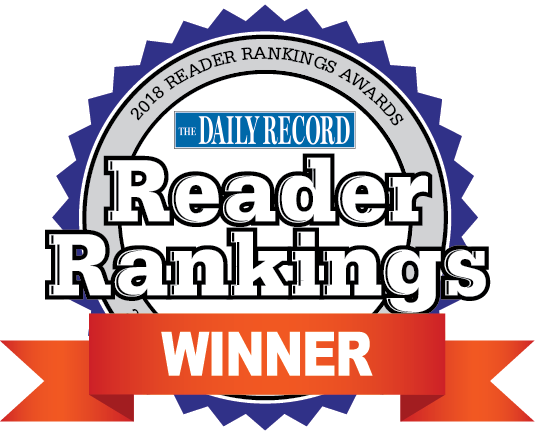 Hailed as “Maryland’s trusted source for business, legal and government news”, the Daily Reader rates law firms in 40 different categories on an annual basis, only selecting the most successful and trusted firms to recommend to Maryland residents. D’Amore Personal Injury Law focuses on the realistic needs of people catastrophically injured by the negligence of others. With over 20-years of successful practice, Mr. D’Amore genuinely understands the impact that personal injuries have on clients. Our committed attorneys work tirelessly to assure clients receive full and fair compensation, allowing them to focus more on healing. Our priority is to seek justice for our clients and their families. Congratulations to everyone on the D’Amore Law team for your tireless efforts and dedication- keep up the amazing work!